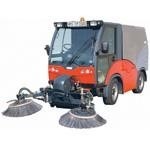 The Hako-Citymaster 2000 is a high-end compact sweeping vehicle designed for flexible, all-year operation, offering urban cleaning with low service-life costs. Built robustly as a proper utility vehicle with ease of serviceability at top of mind, the Hako-Citymaster 2000 has a low-consumption, EURO 5 engine that has raised the bar and set new standards with regard to machine durability, reliability and efficiency. The 2-brush system has a working width of up to 2.50m and hydraulically driven disk brushes that can be individually adjusted for speed, pressure and working width from the comfort of the driver’s seat. The 3-brush system available provides extra flexibility to enable cleaning under park benches and footsteps.